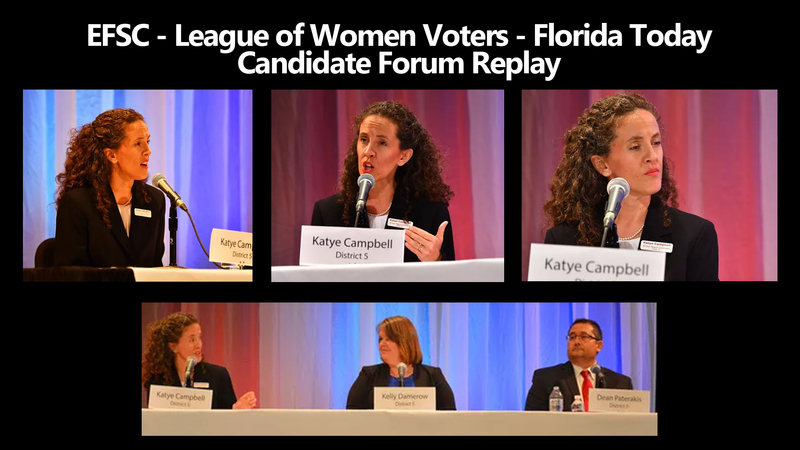 Katye knocked it out of the PARK last night in the ESFC-LOWV-Florida Today Candidate Forum! Check out the full video below from Florida Today. EFSC and Florida Today did a great job televising it and we would like to thank Isadora Rangel for her skilled moderation, the technical crews and all people at ESFC, the League of Women Voters and Florida Today for doing a wonderful job. Katye starts at the one hour mark below, so you can drag over for District 5, which is our District. Fyi, you vote by district, so you don’t vote for candidates that are not in your district. Take the Be Educated for Education Challenge! 2) Read the articles on the first 3 pages of the Google search, especially non school board race issues. 3) Watch videos where the candidates speak and hear their views. Spend 20 minutes on this and you’ll thank us that we care that you know who you are voting for. Here’s the correct spellings of each candidate! As always, if you have specific questions you can contact each candidate individually. You can always email Katye directly or call on the phone number at the bottom of the page for any questions about her views or stances. Be Educated About Education and pick the person that best fits your views and who you trust in leadership. It’s your vote! Katye and her opponents begin speaking at the 1 hour mark of the video. Political advertisement paid for and approved by Katye Campbell for Brevard School Board, District 5.